El Pescadero and Todos Santos are situated in a micro-climate where we enjoy over 340 sunny days per year with an average temperature of 78F. 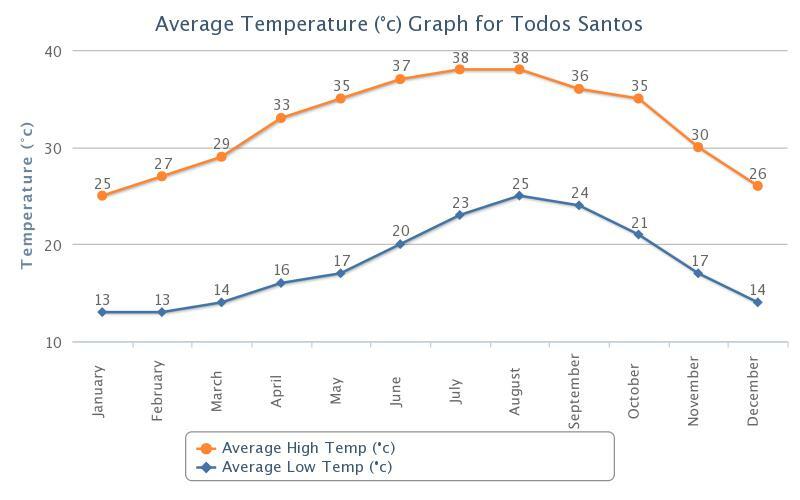 We are usually 10-15 degrees cooler than Cabo or La Paz during the hottest time of the year. Are there insects in Baja California Sur? We do have an occasional scorpion, but presenting anaphylaxis to a scorpion sting is extremely rare here. However, we do have emergency medicine if it should be needed. Most of the year (Nov-July) there are usually few flying insects to worry about, our ocean breeze and dry climate keep mosquitoes to a minimum, but it’s good to have bug repellant just in case. We appreciate your concern for safety in life and while traveling in Mexico. Although we understand that drug related violence has been extensively reported in the U.S. press, we want you to know that it is predominately confined to the border with the United States and a few cities within the areas of drug production. Southern Baja is far from the centers of drug trafficking and the problems associated with it. Mexican nationals, local residents and travelers alike, feel safe to walk down the street any time during the day or night. Children and families play in the area without fear. For a comparison you might think of going to Big Sur or Lake Tahoe and wondering if the violence in Los Angeles is something about which to be concerned. If you have any other doubts or specific questions please do not hesitate to contact us. Immigration regulations require that you have a valid passport for travel to Mexico. You will be granted a tourist visa once you arrive in Mexico and pass through customs at the airport. Most tourist visas are issued for 30 or 90 days, however you can ask the immigration officer to make it for up to 180 days if you plan to stay longer in Mexico. Keep you tourist visa in a safe place, as you will need it upon exiting Mexico. If you are attending a retreat with us, roundtrip ground transportation is included in the cost of your retreat as long as you arrive at the airport within two hours of the first and last arrival time for your group. If you need or desire to rent a car just about every major car rental company is available at the airport and in each town. Check in and out times vary. For more information Contact Us today. Do you have families with children visit you? We frequently host families with children of various ages, especially during vacations and holidays. Do you have telephones for guest use? We have a house phone (VOIP) available to guests and calls to the US/Canada are at no cost to guests. 682-738-7328. How can someone reach me in the event of an emergency? Will I be able to use the Internet and check my email? Wireless Internet is available in and around the pool area; please bring your own laptop as we do not provide computers. In the dry season (November-April), summer and fall garments are suggested, including a jacket or sweater for cool nights and mornings. 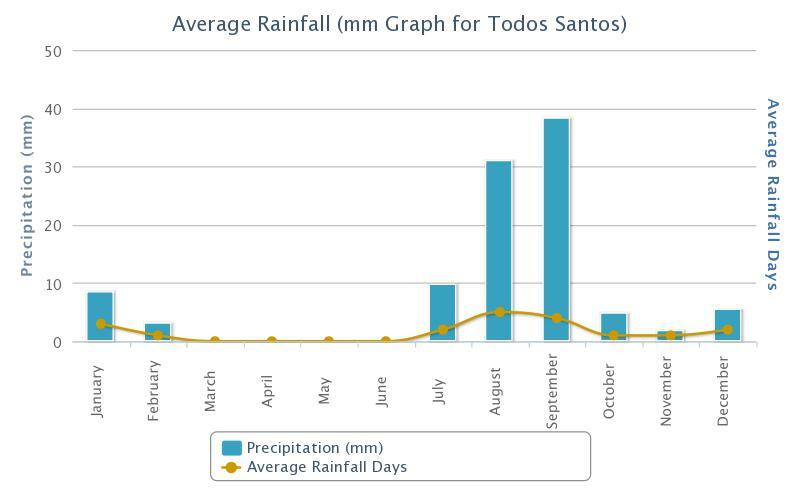 For the rainy season (Aug-Sep) we only have about 5-6 inches or rainfall. Dress to stay cool -- loose cotton shirts, tank tops, shorts, sundresses and sandals and don’t forget your bathing suit! Personal toiletries and hygiene products, a supply of medications you use, sunscreen and sunburn lotion and insect repellent. Sunglasses, sun visor and/or hat, flip-flops and comfortable walking shoes. Camera, flashlight and extra batteries. Water bottle for purified drinking water, small daypack and money belt. Do I need to have special immunizations? No, there is no need for special immunizations. Will I have problems because of the food and water? Hygienic food preparation measures are closely followed by our staff. Purified drinking water is provided for free to every guest and is readily available. We also have alkaline water available. What if I get sick while visiting? We have emergency vehicles and “Americanized” hospitals available close by along with Mexican hospitals and emergency centers. What is Baja Retreats’ policy with regard to illicit drugs? Illicit drug use is strictly prohibited at our facility. Guests found using them will be asked to leave. When and where should I exchange money? Airport transportation and excursions can be paid in US dollars and almost everyone accepts dollars in Mexico. So you do not need to exchange too much money to pesos, save for shopping at the Market place or buying things at local business’s where the exchange rate works in your favor. The best exchange rates can be obtained at any of the local banks. Money exchange companies are available but with a bit higher exchange rate. Will I need extra spending money? Sure…bring as much as you would like to spend. Our retreats include gratuities. However, our service staff relies heavily on gratuities to support their families. Also, within the local area it is the same. Baja Retreats accepts cash, direct deposit, wire transfers and PayPal payments. Baja Retreats requires a 50% deposit at the time of booking with the balance due 60 days from the date of arrival. If, within 60 days of your arrival date at the time of booking, payment in full is required. If a cancellation is requested you will receive a refund of 50% if, between 60 to 30 days of your arrival date. Cancellations that are within 30 days of the arrival date are non-refundable but you will be given 12 months from the original arrival date in which to apply the money towards another retreat during that 12 month period. Rescheduling and, reservations in general, are based on availability.